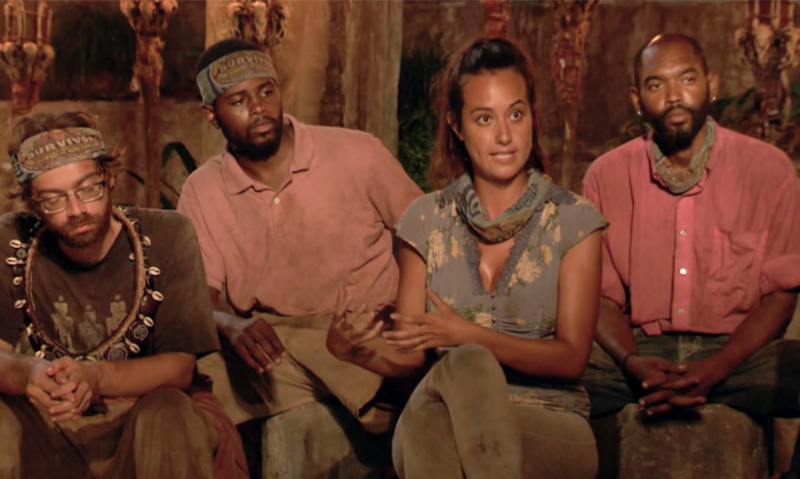 Christian, Davie, Angelina and Carl — four competitors in "Survivor: David vs. Goliath" — engage Jeff Probst during Tribal Council. For some, the show provides a bonding experience with family and friends during the holiday season. If you’re looking to catch up on the current season of “Survivor” over holiday break, here’s some background. As fans prepare to ring in the 38th iteration of the smash hit in just a few months, The Daily’s Fall Quarter managing editors reflect on “Survivor: David vs. Goliath” and provide an outlook on the show as the competition nears the end this holiday season. Jonah Dylan: Well it’s December, and you know what that means: It’s time to gather with family and friends — and start getting ready for the last few episodes of another Survivor season. Right now there are eight people left in the game, and it looks wide open for everyone except Angelina, who has no chance of winning. Troy, who’s your frontrunner at this point? Troy Closson: Sometimes the strongest players don’t win. And you’re right, Jonah. This season’s jury members would resent Angelina’s self-assured tenacity and outspoken control of the early votes if she makes it to the final three. Nick, on the other hand, looks like he’s got it in the bag. Everyone left loves the 27-year-old Kentucky native, and now he’s sitting pretty with an immunity idol. He would win my vote in this festive time of year, who’d have yours? Dylan: The obvious frontrunner is Christian, who’s been viewed as threat almost since day one but has survived to this point. A mark against him is that he was saved by Davie’s idol, but he arguably has more relationships with the remaining players than anyone else. He’s also proven to be better than expected in immunity challenges, and is well-liked by many members of the jury, including the #Brochachos. If he makes it to the end, he deserves the win. Closson: After thirty days of dealing with Christian’s irritating antics and drawn out answers at Tribal Council, these castaways aren’t about to let him make it another nine. Also, Gabby looks ready to blindside her closest ally who just backstabbed his alliance with the Davids. That’s not the holiday spirit. With all the big moves, nullified idols and secret alliances, Christian’s gameplay just doesn’t match up. Still, it’s been a great season so far, but what would make it go down in history for you over these final episodes this December? Dylan: Has it been a great season so far? I’m down on all the new advantages, tribe swaps and idol nullifiers. Survivor was best when you knew what was coming with advantages but never knew what would happen at any given vote. All time greats like Russell and Boston Rob would scoff at the ridiculousness of today’s game. Going back to Gabby, I don’t think she’ll be able to rally the votes against Christian. But do you really think this season will go down as a great one? Closson: I’m assuming you missed the episode with the best six words in Survivor history: “Natalie, can I have your jacket?” Rewatch it over winter break. I still remember when Tony — the franchise’s MVP — rampaged through the island, crafting spy shacks and lying to anyone who’d listen. I watched in awe. I love the reckless gameplay and confident carelessness, and with players like Angelina and Alec, this season’s been nothing short. Dylan: Let me stop you right there. The best six words in Survivor history came when Boston Rob said “he’s like the hobbit, on crack” about Russell. Speaking of Russell, he’s the real Survivor MVP, the greatest to ever play the game. Anyone who can’t see that clearly isn’t a true student of the game. Closson: Calling a two-time runner-up the greatest to ever play is just a bad take. But with this season ending on the 19th — in just two weeks — it looks like we’ll see who’s the real student of the game soon. Until then, enjoy the holidays Jonah.